Join Lono, a Hawaiian fisherman, as he dives below the ocean waves to search for his missing fishhooks. 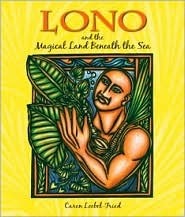 Deep below the sea, at the foundation of the Earth, Lono instead discovers an enchanted land filled with abundant food plants and gains the knowledge of growing these plants for the people of his island home. This beautifully illustrated storybook, filled with Loebel-FriJoin Lono, a Hawaiian fisherman, as he dives below the ocean waves to search for his missing fishhooks. Deep below the sea, at the foundation of the Earth, Lono instead discovers an enchanted land filled with abundant food plants and gains the knowledge of growing these plants for the people of his island home. This beautifully illustrated storybook, filled with Loebel-Fried's signature wood block prints and vibrant colors, is based on Mary Kawena Pukui's translation of "Mo'olelo Kahiko no Kumuhonua", from the Bishop Museum Archives. The original Hawaiian text is also included. This storybook also provides ethnobotanical information on traditional Hawaiian food plants, as well as an after word on Lono and the Makahiki season for readers of all ages. About the Author Caren Loebel-Fried is a storyteller and second-generation carver who learned the ancient art of block printing from her mother. Her award-winning illustrations have appeared in many books and magazines and her stories are regularly published in Parabola. She spends her time with her husband and son in Volcano, Hawaii, and in New Jersey. I picked up an autographed copy! Yay!There are many stories of the God Lono. This one is about Lono as a farmer. He went into the water and learned to grow amazing things. When he left, he left with cuttings of the plants. He planted them all around Hawaii. People still care for these plants.